This is a first of my ‘Learn to Cook’ series I will be sharing with you. Today, I will show you how to make oatmeal from scratch on the stove. This recipe is part of my learn to cook series, where I am cooking every recipe out of my old home economics cookbook. Why am I doing this? I recently found my Home Economics book again from junior high school. Now I took this class more years ago than I care to admit, but this was one of the ways I learned how to cook. You see when I was in junior high while you weren’t mandated to take home economics you could take it. So I did. For years I have wanted to cook my way through this cookbook, and that’s what I am doing. I thought I would take you along with me on this journey. I will start with How to make oatmeal from scratch. Did you know there was a time when oatmeal didn’t need to be prepared from a microwave? Granted we all have benefited from tucking a few of these in our desk while at work, and keeping a few of them around the house for when we just don’t have time to cook. You can make this more inexpensively from scratch, and it tastes, yes you guessed it, better when you make it fresh. Let me walk you through the oatmeal first. There are a many of types of oatmeal. 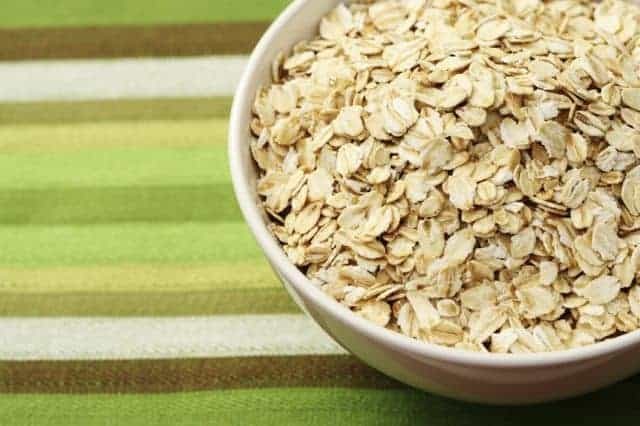 I am going to keep this recipe focused on rolled oats, those would be the ones you typically find in those large cardboard cylinders at the grocery store. They are called rolled oats, and they come in an old-fashioned and then instant or quick. Companies take the oats they steam them and then they are rolled into flakes. The instant ones are rolled out longer and steamed longer and this makes them cook more quickly. You could also top this oatmeal with maple syrup, butter, a little bit of milk, or other types of fruit and nuts. I have a co-worker that swears by a little curry powder. Whatever you do, you can make it your own. Learn how to cook a hearty bowl of oatmeal for breakfast. Bring the water, salt, and spices to a boil in a saucepan. Stir oatmeal and raisins into briskly boiling water. Cook 1 minute for quick or instant, or 5 minutes for old-fashioned. Stir occasionally. Cover the pan, remove from heat and let stand for a few minutes. Serve with brown sugar and milk if desired. I like rolled oats much better that instant. I want to go back further than Jr. high to my great great grandmothers day and make rolled oats from whole grains from the field. Does anyone have a clue? Actually, you don’t have to put milk in it to make it creamy. Just take the old fashioned oats (I like the extra thick variety) and start it in cold water. As the mixture heats up to boiling, the resulting oatmeal is very creamy. The thinner the oat flake, the creamier the oatmeal. I like creamier oatmeal, so I would have add a bit of milk to the end product. Looks good! What a fun idea for a series! I have to say some of the food had been surprisingly good. Most of these recipes I haven’t cooked ever.